Vitamin D: There is a rare form of pneumonia (Pneumocystis carinii pneumonia) that doctors only find with very weakened immune systems. It’s rare enough that if diagnosed a doctor will strongly suspect AIDS. Researchers now think that getting the flu is a sign of a vitamin D deficiency just as the rare pneumonia is a sign of AIDS. That is they think that if vitamin D levels are high enough the flu becomes rare instead of common. Dr. John Cannell, president of the Vitamin D Counsil, says that you need your blood levels to be at a minimum of 50, preferably above 60. The amount of vitamin D supplementation needed to get here varies from person to person, but it’s usually a minimum of 4,000iu per day. 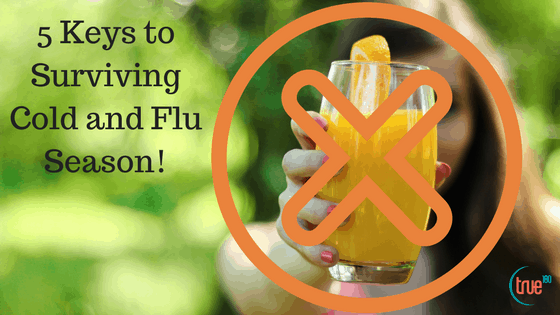 Skip the OJ: Orange juice is sold under the pretense that it will boost your immune system. However the opposite is probably true. Oranges are pretty healthy, but orange juice is the nutritional equivalent of soda – ounce for ounce they have the same amount of sugar. Sugar (or any refined carbohydrate) suppress your immune system for hours after consumption. Avoiding sugar and refined carbs will help your immune system stay at peak function to keep you healthy. Sleep: Most adults need a minimum of 6 hours per night for fitness, health and fat-loss. 7 is usually better. Sleep consistency is also very important. That is you want to get about the same amount of sleep most nights because large changes in the amount you sleep can suppress your immune system. For example sleeping 10 hours then four hours is an average of 7, but that huge drop might make you sick. Probiotics: the microbes that live in your guts are your first line of defense against infection (and so much more!). There is a lot of fascinating new research showing that probiotics will help you avoid getting sick, and, if you get sick, decrease the length and severity of your cold or flu. (Here, here, and here.) Taking probiotics and/or eating fermented food daily might be really helpful. Train don’t drain: work hard, workout consistently, but remember that the goal is to get better – stronger, thinner, etc. – not. Pushing to the point of being/feeling drained actually reduces results and suppresses your immune system creating an opportunity to get sick. From research it seems like the longer you workout the worse it is for your immune system. Try keeping things to an hour or less, and it’s probably a good idea to save your marathon running until after flu season. Disclaimer: please don’t substitute a fit tip or a blog post for specific medical advice. Did you see what Amy has to say?! She’s lost over 85lbs!